2/2/2016Share this story on Facebook! Many students enjoy the peaceful, natural beauty surrounding Ithaca College. But for those students who crave a taste of the Big Apple, the ICNYC program can be just the thing. The ICNYC program allows students to spend a semester in New York City, taking courses and pursuing internships of their choosing. By the end of the semester, most students have gained valuable resources and industry connections that can assist them after graduation. 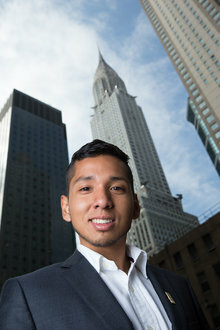 ICNYC helped Luis Naupari ’14, M.B.A. ’15, find the perfect internship related to his accounting major, which then led to a job after graduation. Originally from Queens, Naupari saw the ICNYC program as a way to live at home again while experiencing New York City in a different way. Naupari also felt that graduating without any prior accounting experience would have been a setback in his career, so he decided to enroll in the ICNYC program during his senior year in the hopes of benefiting from an internship. With help from an IC School of Business associate dean, he secured a position with Marks Paneth, an accounting firm in the city. Naupari learned the operations of an accounting office and became familiar with the jobs performed by tax professionals. He also took an elective class through IC called Art in NYC. His experience in the class drastically changed his perspective of the city and exposed him to things he never would have explored otherwise. “The instructor took us to all these different art exhibits and museums,” Naupari said. “We went to new galleries that I never would have thought to visit. [Art in NYC] was one of the more rewarding experiences. I was impressed with every outing that we had,” he said. After graduating with a bachelor of science degree in accounting, Naupari went on to earn a master of business administration from IC in business accountancy. He is now working as a tax associate at Marks Paneth and working toward becoming a certified public accountant. Andrew Ronald ’15 enrolled in ICNYC after deciding to dedicate an entire semester to his professional development. The film, photography, and visual arts major interned with Nickelodeon and MTV360 through Viacom’s internship program. “When you think about growing up and how you’ve watched all these programs, you never really think about what it actually might be like making that content,” Ronald said. Ronald remembers being overwhelmed at the internship interview, but says that he ultimately got his dream job working in television production. Ronald is now a production assistant for Nickelodeon and said networking helped him stay with the company. When a production assistant was leaving Nickelodeon, she asked Ronald if he was interested in applying to be her replacement. He said networking is an essential skill that all students should learn early on. Eric Brown '14, a sound recording technology major, had worked at NBC Universal for four years before entering college and went to the city during his senior year to expand on his skills there. He enrolled in the ICNYC program after his advisor recommended it, and the experience gave him opportunities to develop contacts in the city. Brown said it was a challenge at first to keep up with the speed of New York, but it was also a great new experience. He said living in the city full time was difficult for him, especially because of its size, but he is grateful he took the opportunity to intern there. He currently works as an audio engineer at Molehouse Post, a small video-editing studio in Brooklyn, and he started his own company called Waterline LLC, which offers sound post production and finishing services for film and television in New York City. Brown has worked on HBO Sports documentaries, ESPN 30 for 30, and Emmy-nominated compositions for the U.S. Open.